Rockway Mennonite Church began as a "church plant" by First Mennonite Church in 1960 in Kitchener, Ontario. Already a large congregation and facing the demographics of the coming "baby boomers," First Mennonite needed to choose between an addition at its current site or planting a new congregation to relieve some of the pressure. It chose the latter. First Mennonite selected a site only two km (one mile) from First Mennonite – on the campus of the then 15-year-old Rockway Mennonite School. The rationale included rapid growth in the Rockway subdivision, and its Mennonite Youth Fellowship experience holding Vacation Bible Schools in that area for several years. The first services were held at the school on 2 October 1960, when 51 persons met with First Mennonite pastor, Ed Metzler, in the "Old Barn." For almost two years memberships remained at First Mennonite. The results of visitation to homes in the Rockway community were not promising, and the fledgling group briefly considered returning to First Mennonite. Although the congregation later thrived, it never became a community church, but rather became a destination congregation for Mennonites who liked its theology and worship style. Rockway was formally accepted as a separate congregational member of the Mennonite Conference of Ontario (part of the Mennonite Church) in June 1962. The initial membership was 22, but by 1967 it had reached the 70s. The church met in the Barn until it was dismantled in 1968; it then met in the school's library. Howard Good, who had taught at Rockway Mennonite School and served as the pastor at Preston, was asked to become the part-time pastor at Rockway in October 1961. He served during the church's most "traditional" period. The congregation then assumed it would eventually build or buy its own building, and established a substantial fund for that purpose, again with the assistance of First Mennonite Church. Rockway in those years worked hard to provide traditional Sunday school and other peer-group activities for all age groups. Some innovations began, as Rockway began to invite more academically-oriented speakers like John Howard Yoder to make presentations. After Howard Good resigned in February 1966, the congregation looked within its own membership and called John W. Snyder as a half-time Pastor/Coordinator; he began in January 1967. Snyder, who had been a pastor, farmer and book store manager, was an innovator, and had helped to found Rockway Mennonite School and Conrad Grebel College. Rockway Mennonite Church’s program had become even more lay-led during the gap between Good and Snyder, with a Worship and Service Committee doing much planning, with many lay persons participating in leading aspects of worship. The traditional adult Sunday school class was transformed into a sermon discussion group. 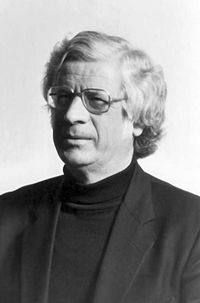 This sermon discussion group continued for decades, and was chaired in its early years by Norman High, Dean of Arts at the University of Waterloo, until his death in 1974. John Snyder continued his leadership role until 1990, and his vision and theological orientation profoundly shaped the church during his tenure. Rockway gained a reputation as an "academically-oriented" church, with many members from the faculties at Conrad Grebel College, University of Waterloo and Wilfrid Laurier University. Rockway, initially a member of the Mennonite Church, became a "dual-conference" congregation in the mid-1970s, joining the Conference of Mennonites in Canada in 1975 and the United Mennonite Conference in Ontario and the General Conference Mennonite Church in 1976, thus anticipating the eventual merger and realignment of these denominations in the late 1990s. During John Snyder's years the congregation had decided that use of a shared facility for the congregation's program was better use both of space and finances. It moved into the new multi-use facility at the now Rockway Mennonite Collegiate for its worship in 1980, and continued in that location until 2005. However relationships between the church and the collegiate were occasionally strained because of competing demands for space, and further additions at the school pushed the church’s Sunday worship space further into the interior of the building in a manner that was not welcoming to newcomers. Both membership and energy stagnated for a time. In fall 2005 the congregation moved to a shared facility with a congregation of another denomination. It took over and renovated the large Sunday school wing that was part of the Zion United Church in downtown Kitchener on Weber Street. The shared effort within the congregation to prepare the new space revived spirits, and the location within walking distance for many Mennonites living in downtown Kitchener brought fresh growth. The character of the church became less academic than in the 1980s, though the love of ideas still lingered. Peace, justice and environmental issues remained important for the church and the pattern of lay members and outside speakers filling the pulpit for half of the Sunday mornings remained. The link with First Mennonite Church continued through cooperative work with youth. 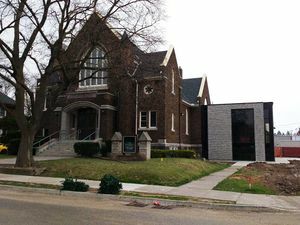 In 2013, when it became clear that a long term lease at Zion United Church was not possible, the congregation decided to purchase the Olivet United Church located on Onward Avenue in Kitchener. The building was purchased in June 2015; the first worship service at the new location was held on 11 September 2016. Canadian Mennonite (19 May 1964): 3. Erb, Peter C., ed. On Being the Church: Essays in Honour of John W. Snyder. Waterloo, Ont: Conrad Press, 1992. Good, E. Reginald. Frontier Community to Urban Congregation: First Mennonite Church, Kitchener 1813-1988. Kitchener, Ontario: First Mennonite Church, 1988. Mennonite Reporter (14 April 1986): 14. Steiner, Sam. "Rockway Mennonite Church: are its Members Still Mennonite?" Unpublished paper, 1973, 29 pp., Mennonite Archives of Ontario. Steiner, Samuel J. Lead Us On: a History of Rockway Mennonite Collegiate, 1945-1995. Kitchener, Ontario: Rockway Mennonite Collegiate, 1995. Steiner, Sam. "Rockway Mennonite Church (Kitchener, Ontario, Canada)." Global Anabaptist Mennonite Encyclopedia Online. November 2009. Web. 26 Apr 2019. http://gameo.org/index.php?title=Rockway_Mennonite_Church_(Kitchener,_Ontario,_Canada)&oldid=149045. Steiner, Sam. (November 2009). Rockway Mennonite Church (Kitchener, Ontario, Canada). Global Anabaptist Mennonite Encyclopedia Online. Retrieved 26 April 2019, from http://gameo.org/index.php?title=Rockway_Mennonite_Church_(Kitchener,_Ontario,_Canada)&oldid=149045. This page was last modified on 11 July 2017, at 19:55.